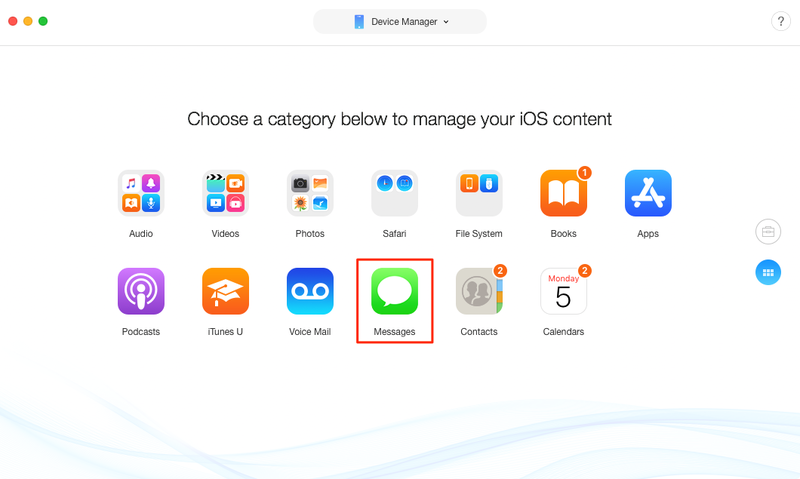 How to backup messages on iPhone? 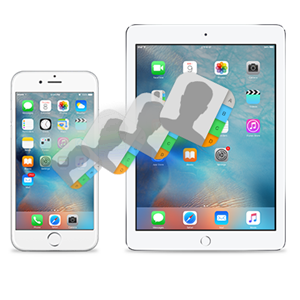 Read this post to get a quick way to backup SMS text messages and iMessages on iPhone 6s/7/8/X/XS/XS Max/XR. 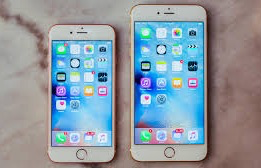 Text messages and iMessages on iPhone are important forms of communication with family, loved ones, friends, and colleagues. Backing up your iPhone regularly is a good way to prevent data loss due to mistakenly delete, iOS update, jailbreak, or iPhone broken. You can backup text messages on iPhone via iTunes or iCloud, but you should know that neither iTunes nor iCloud allows you to view the text messages on backup. You have no access to the text messages unless you restore your iPhone from the backup. So can you backup text messages on iPhone in a readable format? Of course YES! In our article, an iTunes alternative to backup iPhone text messages to PC/Mac will be introduced. Head to know the details. You can preview and backup up All or Selected messages on iPhone to computer. Unlike iTunes & iCloud, you have no choice to decide which messages you want to backup. You are allowed to save text messages on iPhone to computer in pdf, txt, or html format, and you can view them anytime as you need. You can backup all the text messages, iMessages, and all attachments like pictures, audios on your iPhone. Usually, you are not allowed to access iTunes/iCloud backup directly, but AnyTrans for iOS now provides you a way to access and view content in iCloud and iTunes backup. So you can view messages in iCloud & iTunes, and you can even download them to computer. You can also copy text messages from old iPhone to new iPhone. 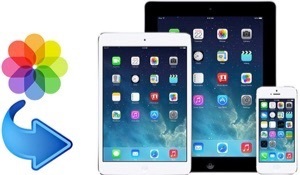 AnyTrans for iOS, developed by an Apple-trusted developer, is Norton, SSL and McAfee secured. It is a completely green software and we could guarantee you 100% security to your device and no information leakage would occur. 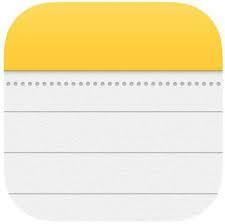 Why not free download it now and follow us to backup text messages on iPhone to PC/Mac. Step 1Install and launch AnyTrans for iOS on your computer (PC/Mac) and then connect your iPhone to computer. Step 2Scroll down or click the tab to go to category management page, select Messages option. 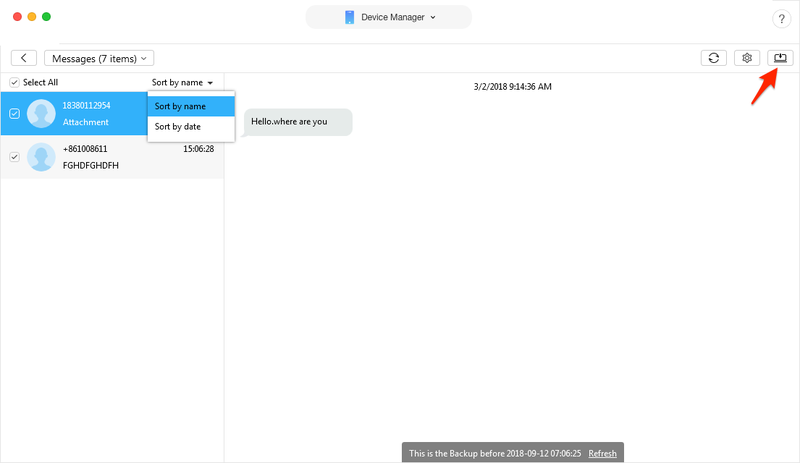 Step 3Preview and select conversations you want to backup, tap the To Computer tab to backup text messages on iPhone 6s/7/8/X/XS/XS Max/XR to PC/Mac computer. Note: Before you click on To Computer button, you can also set the text message output format in Settings button (Here we take .html as an example). You can also choose the export & backup path. Step 4After backup, you can move to the backup, you move to the backup path to check them now on your PC/Mac. After finishing these steps, you don’t need to worry that your precious text messages disappear forever. 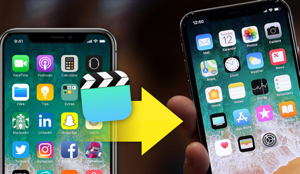 Give it a shot and learn more about how to backup text messages on iPhone 6s/7/8/X/XS/XS Max/XR. 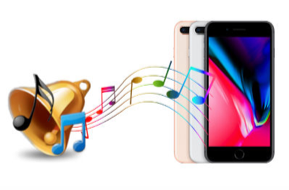 When you back up your iPhone via iTunes on computer, the text messages will also be backed up, but as we said in the first part, you cannot view or read the messages in iTunes backup directly. Besides, iTunes backing up is a long journey, because it backs up the whole device. And you cannot selectively back up the items you want. So for a faster and smarter operation, we recommend you move to Part One with the more user-friendly tool. Step 1Open iTunes and plug in your iPhone to your computer. Click the device button. Step 2Under Summary, you will see your iPhone info. In the Backups section, click on “Back Up Now”. iTunes will start backing up your iPhone as well as text messages. If you tick the option of“Encrypt iPhone backup”, that is to say, you encrypt this backup. 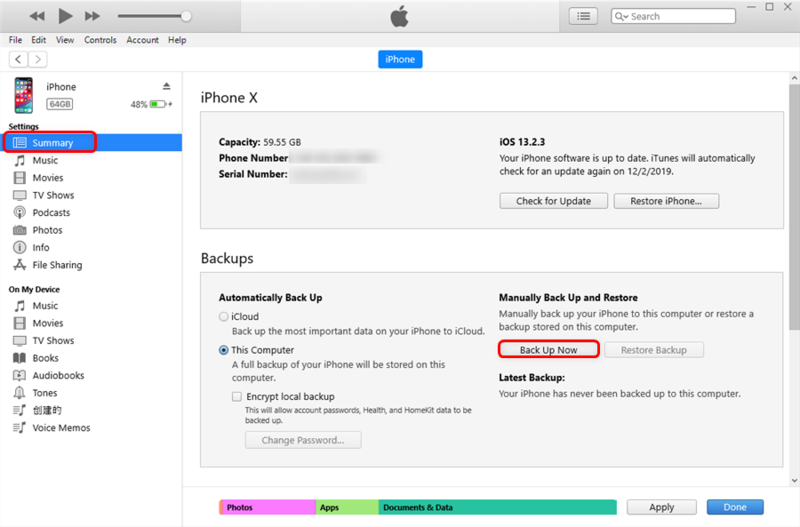 Please notice that you’ll be not allowed to unlock the backup if you forgot iTunes backup password, so, keep it in mind firmly. Step 1 Make sure your iPhone is using a stable Wi-Fi network and connect your iPhone to a power source. Step 2 Go to “Settings” and tap on your name at the top of the screen. Scroll down and choose your iPhone. Step 3 Choose the “iCloud Backup” option and turn on “iCloud Backup” switch. For previous iOS versions: Settings > iCloud > Backup (Storage & Backup). 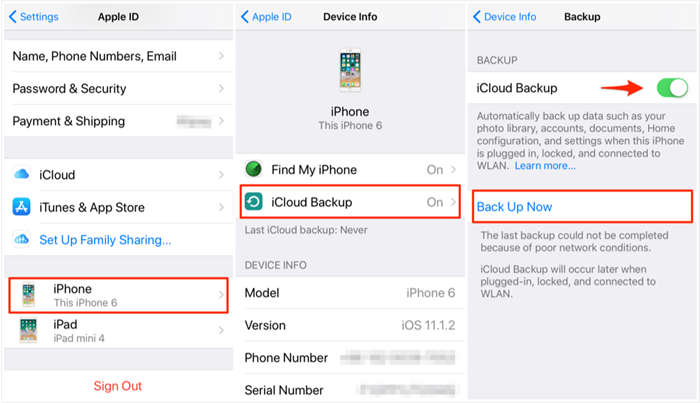 Step 4 Tap on “Back Up Now” to backup text messages on iPhone to iCloud. Please keep your iPhone connected to Wi-Fi network until the process completes. Just like iTunes, iCloud also backup the whole device, instead of selectively choosing data types. So it will be very time-consuming, and not user-friendly. iCloud backup also requires your iPhone charging and connecting to WiFi, and then it will start backing up. So base on these annoying issues, we recommend you move to Part One with an easier tool. If this article helps you on how to backup messages on iPhone, don’t forget to share it with more friends. And any questions or problems, don’t hesitate to leave them in the Comments Section.